To study, develop and experiment with systems and tools for optimising energy use at a district level. Maximise consumption based on available sources of renewable energy, as well as maximise the efficiency of the district subsystems, reducing the CO2 emissions associated with energy consumption in the district. The proposal of the AMBASSADOR project is to study, develop and experiment with systems and tools for optimising energy use at a district level, by means of the management and the prediction of energy flows , and management of energy consumption and production. The project thoroughly examines the behaviour (static and dynamic) of the various energy systems that can be found in a district. Based on this information, management systems were developed to undertake local optimisations at component level and optimisation algorithms for energy management at building and district levels, and that took into account predictions of behaviour of all the players involved. 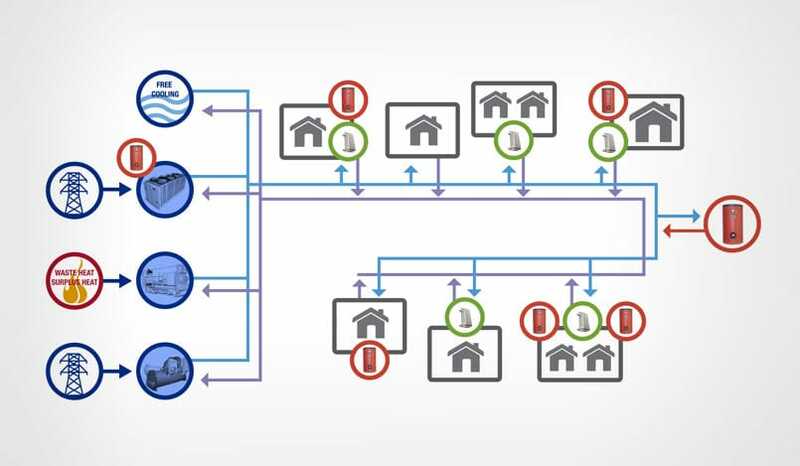 IK4-TEKNIKER is responsible for the development of simulation models and optimisation algorithms for the subsystems that make up a district’s heating and cooling networks. It also contributes its knowledge and know-how on electricity storage technologies such as flywheels and redox flow batteries, through the development of models that enable predicting their behaviour. It is also taking part in the development of a communications solution based on generic and open protocols and that enables the interconnection of the different subsystems and monitoring elements with the software platform responsible for the management and optimisation of the district. As a result of this overall optimisation of the district, the consumption based on available renewable energy sources will be maximized, as well as maximising the efficiency of the district’s subsystems, reducing thus the CO2 emissions associated with the energy consumption of the district.